Winters of my early years featured a ritualistic layering on of socks and thermals and outerwear and toques and winding and winding and winding of a very looong hand-knitted scarf until only your eyes showed. This allowed you to see what there was to see once you waddled out the door for a long snowy ramble - in below-freezing temps you welcomed because you'd begun to sweat by the start of all that winding - across fields, around frozen sloughs, and through barbed wire fences thanks to an older sibling who held the strands apart so as not to let your snowsuit get snagged. Good times. All these years later I realize sending us thus adventuring was a valuable tactic for preserving my mum's sanity while preventing cabin fever amongst her brood - and, of course, with the underlying intent to instill in us a sense of independence and confidence in our own capability. (Yah, that''s what Mum was thinking about by the time she was shooing little Number 7 me out the door into the brilliant Alberta winter sunshine and snow.) Modern patois labels this 'free-range parenting'. In our era, it was commonly called, 'Go outside and play until I call you in for supper'. 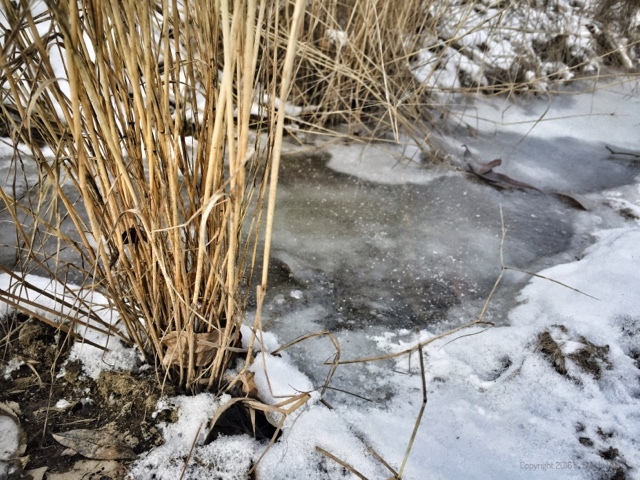 The pictured mini melange of grass and ice reminds me of the bunchy grass edging a winter slough. Ah, nostalgia! Days I wouldn't trade. It may not keep your eyelashes from frosting on a day like today, but it sure makes for a toasty heart. Chuckling out loud...SO true:) I esp. related to this... 'and toques and winding and winding and winding of a very looong hand-knitted scarf until only your eyes showed'...I think it was an unspoken contest to see who knitted the longest scarf. i remember tripping on mine!